What free firewall would you recommend? It should be lightweight and smart. And do I need a firewall at all? I use Online Armor Free and I have no problems. OK, I'll give a try to Online Armor for now. What about Outpost? Fitting your description for light and smart I recommend Comodo firewall. It's what I currently use, and it is configurable with some extra goodies in it like HIPS and auto-sandbox. 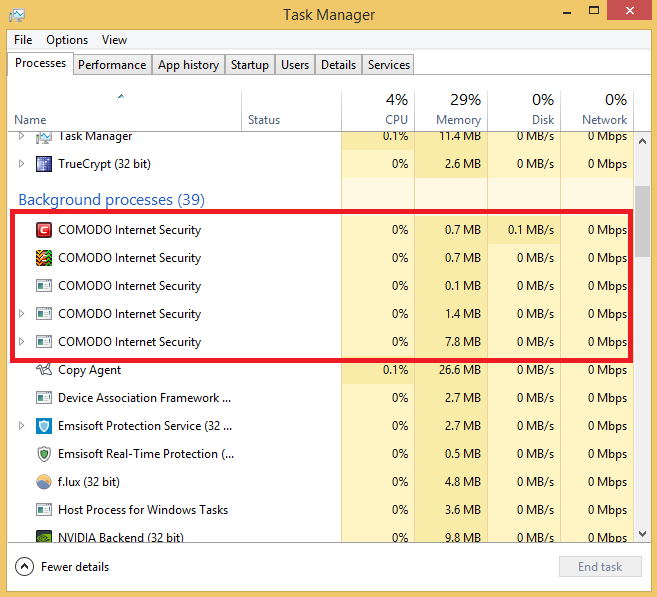 Here is a screenshot of Comodo Firewall free resource usage idling. Two others that are not smart but are light are Windows Firewall Control and Tinywall. Just because they are not smart firewalls doesn't mean they are not effective, though. Using the recommended settings they work as a whitelist. Only allowing connections from programs that you specify. The drawback to these programs is it is a pain to whitelist many programs that need internet connections. Edit: You do need a firewall for more security while your machine is connected to the internet. Firewalls are not bulletproof but do add an extra layer of security. This does not mean you have to download a third-party firewall! Windows comes with a firewall preinstalled. Windows 7 and 8 firewalls are good. If you are using XP then you definitely need a third party firewall. Add firewall free depends on how you use your computer . Not many free firewalls and choose the most appropriate depends largely on your antivirus . For example, when I think of a firewall free the first thing I think is in Comodo , but I 'm using Qihoo 360 TS and I think to avoid duplicating services combines best free ZoneAlarm firewall. On a computer with limited resources have Privatefirewall + Crystal Security and Xvirus Personal Guard. Here are some very good compare these products. The fact you have to ask if you even need a firewall tells me you are not familiar with them and advising you to grab one of the two most complicated firewalls on the market just does not seem like good advice to me..
First, we need to ask which Operating System you are running, and what you have already for security. Secondly i assume your behind a router with a built in firewall already? Thank you for your fast answers, I'm using Windows 8.1 with BitDefender free. Yes, I'm behind router with firewall enabled. I'm familiar with antivirus, but not firewall. Now I'm trying Online Armor. Windows firewall would be sufficient on windows 8.1 behind the router, no need to use a third party firewall, especially one that you will have to manually set rules for here and there. Misconfiguring Online Armor will land you in a world of trouble, especially if unfamiliar. You are welcome. You will be fine with the built in windows firewall.. I would recommend backing up your system and personal files before diving into learning a firewall like OA. In my experience, Online Armor has been a very good firewall. However, my PC uses Windows Firewall and it's fine too, so you can live with the default. Never tried Comodo. I couldn't suggest any other firewall as Windows Firewall is good as is, but if I had to pick another it would be Online Armor. Do you only go to the internet via your router or do you sometimes frequent connecting to public WiFi? If it's only the first one, then Windows Firewall should be sufficient like others have said. However if there are times when you connect to a public WiFi, then it might be best to install a third-party firewall. Comodo would be a good one, but it requires some knowledge to learn how to use it. If you're interesting in learning more about firewalls, I'm sure the members here would be more than happy to help you.